Baby Hazel Valentine’s Day is the latest installment in the Baby Hazel game series. This is an educational game for toddlers where kids associate, recognize, find, and match images. This game helps develop hand eye coordination by requiring interaction with the baby through mouse clicks, and also helps kids with following simple instructions and patterns. In this version of the game your goal is to create the best Valentine’s Day for the baby’s parents. You follow step-by-step image instructions in a time frame that is very generous to accomplish the goals of the individual level. There are four levels in all, and options to pause the game, turn off the sound, and turn off the music. In the first two levels you learn the basic functions of the game by doing some simple tasks to keep Hazel happy. These levels takes place in the nursery with Grandpa in the room. In the first level you master the controls and objectives of the game. At the end of the first level the parent’s leave to go shopping and the level is over. The second level consists of Hazel starting the preparations for her special day. You help her create some cards and gifts for her family members all while keeping her happy with her Grandpa. In the final two levels Hazel and Grandpa have moved to the beach view terrace. These levels consist of cleaning and decorating the terrace for a Valentine’s Day meal when the parents return. In the third level you set the table for the meal after everything is decorated and ready to go. The fourth and final level consists of the whole family together celebrating their day with a great meal and gifts from Baby Hazel. The pets are even present. This is the final level and if you keep the baby happy and complete her tasks you win the game. 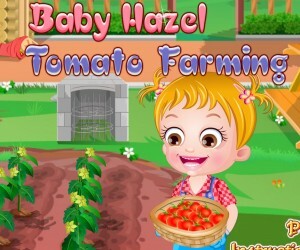 Come let your toddler learn how to match and find simple images, start learning to follow step-by-step instructions, and increase hand eye coordination with this great educational game and other games from www.gamesbabyhazel.com. Today is Valentine Day. Mom and dad have gone shopping. Little Baby Hazel wants to surprise her Mom and Dad with a special meal and presents on their arrival. Lucky she is… Grandpa is along with her, babysitting the siblings while parents are out. Can you join Baby Hazel & Grandpa and help them in Valentine Day preparations? First of all, darling Hazel wants to craft surprise gifts for Mom and Dad. Later they need to clean and decorate the beach view terrace for the party. Help them in cleaning and decorating the terrace. Finally join the wonderful family in their special day celebration. Keep them happy by fulfilling demands and make their Valentine Day worth remembering.